My Steps series has become my compositional travelling companion. It was jointly initiated by my dear friend Michael Bell, from whom I have learnt more about music than anyone else. Equally, the precocious playing of one of his pupils stirred my musical imagination after 12 years of silence, revealing it to be beautiful once again for me. Volume 1 is not intended in any way as a cycle but rather, in the manner of Grieg's Lyric Pieces, a collection from which performers may choose as they wish. It was not, indeed, written as a single entity, being the accumulation of several years' work. There is, intentionally, a wide range of technical difficulty, with some pieces being seriously challenging, others playable by younger or amateur musicians. Some were indeed intended for, and played by, its young dedicatee. They have since been performed in Denmark by young students of my good friend Mario Ramón Garcia. 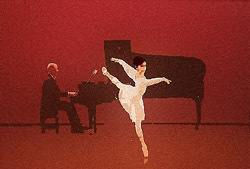 Three were played in Minnesota by Minjeong Shin for her DMA (you can see video on this website's piano page). She has subsequently recorded the whole volume for Sheva Contemporary label.